Asana practice these days has allowed (or inspired!) many things – from exercise physiology, dance, alternative medicines and the likes to corrode its original purpose of preparing the body for long sitting in meditation and opening pranic channels so the flow of higher consciousness can occur. This hybrid breed of asana often called YOGA practice is now used as a way to look and feel better rather than a doorway to higher consciousness. So, is this new understanding of yoga a bad thing? I don’t think so. I believe it is different and veers away from tradition but perhaps it is the modern pathway for an ancient wisdom to impact this world? No one would disagree that there has never been a time more in need of reestablishing the morals and ethics of modern day living. An approach that has been very successful around the world with hybrid breeds of freestyle yoga, is to acknowledge asana as a vehicle of growth, to further understand ourselves. Asana can be viewed as a mirror of our own reactions so we can understand our in-built conditioning. In this type of context, a simple yoga class can be used as a vehicle to great self-discovery and unlock stubborn mental patterns that create our samskara’s. This type of work is invaluable to the modern day world! When the body is under stress, experienced in any mental form, it responds by secreting two major hormones CORTISOL and ADRENALINE. These hormones relate to the sympathetic nervous system and allow the body to deal with situations appropriately (e.g. they produce the “fight or flight” response to immediate danger). However, over a long period, if these hormones are produced in excess they can have detrimental effects on our bodies metabolism, often accelerating metabolic ageing by depleting neurochemicals (serotonin and other bio-chemicals) that provide optimal health and cellular nutrition. This excess can lead to increased risk of degenerative diseases, hypertension and cardiovascular disease. Cortisol is the major hormone produced by the adrenal glands with many life sustaining functions including regulation of blood pressure, blood sugar, mobilising energy in the brain and fighting inflammation and infection. Over a long period of time, too much cortisol produced by stress leads to the depletion of neurochemicals that are responsible for the immune system, fertility plus memory and concentration. It also depletes serotonin production and serotonin is responsible for how we think and feel, we must have enough serotonin to feel good and positive – happiness is really a chemical! So we need to manage this chemical balance throughout our life, in a basic sense we need to manage stress by being able to develop our instinctive non-reactivity or our equanimity… the alternative is that your body will slowly eat away itself! Science has for years told us that when we have a thought or different mental abilities and states that we have certain electrical patterns that can be detected in different areas of the brain. Most of us are in Beta brainwaves most of the time; this is the pattern for normal waking consciousness. Beta waves are associated with concentration, alertness and cognition. As you can imagine, at the highest, most rapid wave level Beta are associated with anxiety, worry and unease. So this is a state that can fluctuate based on external and internal stimuli. This is the brainwave pattern many of us practice asana under. At times we are lost in anxiety about how long we have to hold a pose or off thinking about what could go wrong in the future. As any dedicated practioner will know, it all comes up on the mat! However the next brain wave pattern, that is slower, is Alpha brain waves. In this state concentration is very easy and is what yogis refer to as being present and can be likened to the process of withdrawing from the external senses to one of internal concentration (pratyahara / dhyana). In this state the mind is takes in information, stores it and remembers it, it is what we call the state of super-learning. The next level of brain waves is Theta, produced during dreaming sleep or a deep level of awakened presence and associated with increased creativity and intuitive understanding, what the yogis would call dharana/dyana or concentration and meditation. It is said in this state the left-brain filters that are often self sabotaging (conscious mind) are by-passed making our ability to de-condition the mind easier… Modern psychology would call this an exploration of the unconscious mind and use cognitive behavioral therapy to alter believe systems and positivity. Best of all, Theta is also a state of tremendous stress relief! In the slower Theta brain wave pattern, the brain makes lots of relaxing endorphins that really do– melt your stress away. Increase in balance between the two hemispheres of the brain or what the yogis may refer to as Dyana/Samadhi. During our basic asana practice we are provided with many opportunities for understanding our inherent conditioned personalities and thus transcending the ego over time. This process is at the core of most traditional teachings and it seems, these days, science and modern expressions of Yoga are also aiming to tread the path pf this process – annihilate the ego! The original use of asana was to prepare the body so it can sit in meditation for long periods and to keep it healthy and vibrant so prana channels can flow freely. These days asana is practiced for many reasons varying from bigger biceps to longer hamstrings or just greater general wellbeing. For what ever it is being practiced for, it is great that its growth in modern times continues. Again, any experienced practioner will admit that you can’t just practice the postures and breath without a spark of inquiry being initiated. This inquiry is the doorway to greater depth in our practice and what Yogis would refer to as Swadyaya. I true statement form a wise man. Deconditioning is what modern day psychology calls cognitive behavioral therapy and what yogis for years before call understanding vasanas (trace memories) that leave samskaras in your karmic path. Understanding our belief systems about others and ourselves is the pathway to reconditioning or better still deconditioning the mind! A simple process of asking yourself what are my beliefs about myself, my work, my identity, my life, my friends and loved ones” is a powerful tool to challenge inbuilt belief systems. Our asana practice, even though it is a quick 90min session 3 times a week for the average budding yogi, it gives us time for self inquiry and a chance to see ourselves clearly to challenge belief systems that have been inbuilt with years of conditioning. Asana as a vehicle of understanding and development is so important in this modern day world. Sadly to much importance and credibility has been given to people and teachers who can bend their bodies and hold a wealth of knowledge. I’m here to tell you that you’re just as stupid the day after you put both your feet behind our head! Not enough emphasis has been given to the teaching of a compassionate heart, an equanimious mind and a joyful spirit. Asana are a vehicle for this internal revolution so we can all shine brightly, regardless of how flexible your spine is. “When you are truly at your centre the madness of finding fault in others disappears”. Asana is like the Ferrari of our personal growth to an internal revolution that brings great joy within. Even if you teach asana at a physical level and strip the class of the powerful philosophy that accompanies a great experience, it is still beneficial. But taking away the philosophy that encourages the students to go deep within, challenge themselves and hold themselves accountable is like running the Ferrari on 2-stroke fuel. If a student has been practicing asana for many years and has not changed their perspective on life to be happier, more pleasant person to all, then there is something going wrong. A hard pill for many of us to swallow but asana taught and practiced with the intent of a vehicle of self discovery is like setting sail for new oceans of hope and letting go of the stubborn shores. Duncan Peak is one of Australia most popular Yoga teachers and founded Power Living Australia the busiest Yoga school in the country. He presents and teaches his Power Living philosophy all over the world. 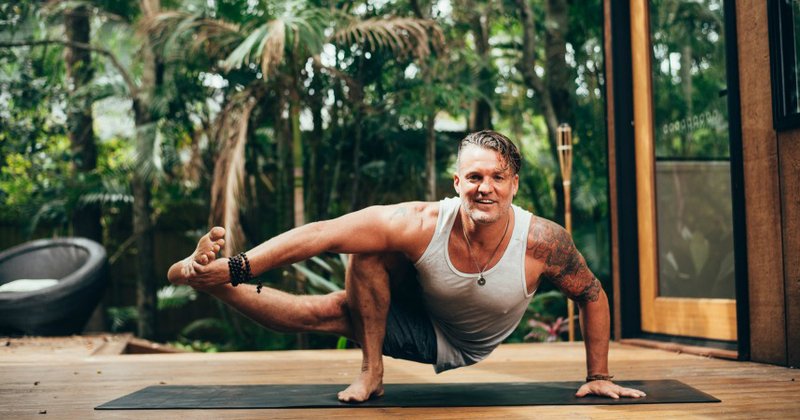 His aim is to teach yoga in a way that makes it more accessible to modern day living and have an impact on the mental health of the people of Australia. For further information go to www.powerliving.com.au.